A home’s plumbing system is perhaps one of its most important parts. 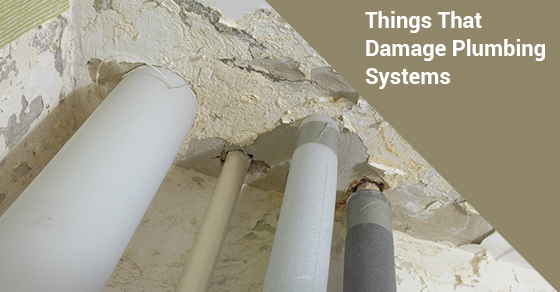 However, it is not uncommon for homeowners to mistreat their plumbing systems without realizing it, causing unnecessary damage and thus setting them up for a lot of problems and expensive repairs. Don’t treat your drains as a trash can. Be very careful with the items that enter your drains, garbage disposal and toilets as certain items can cause a blockage and major problems in the future. This is particularly true of plastic (such as tampon wrappers), makeup remover pads and cat litter, to name a few. You should also avoid getting hair in the drain. Although it won’t necessarily cause a lot of damage on its own, when it combines with other things, such as grease, you will have a blockage to deal with in no time. Watch out for tree roots. Tree roots are perhaps one of the biggest threats to your plumbing system. Over time, they can make their way into your pipes in their search for water and cause significant—and expensive—drainage problems. To avoid this, don’t plant trees close to a lateral line. Also, replace small trees every two years. Never pour grease down your drain. Grease is a major cause for concern when it comes to keeping your plumbing system in good working order. Although it may be tempting, never pour grease down the drain. Instead, pour it in a glass and allow it to solidify overnight before throwing it in the garbage. Failing to do so will mean that the grease will eventually build up in your pipes, cause a blockage and require repairs. Although a liquid drain cleaner, such as Drano, may help you to quickly address a clogged sink, they contain harsh chemicals that can actually cause even more problems for your plumbing system (they are also very bad for the environment). Don’t try to fix things yourself. You may end up causing a lot more damage if you try to fix a plumbing problem yourself. Instead, a contact a plumber to handle the job professionally.